The 2017 EXC range doesn’t represent a model update or some changes to a single bike. KTM has taken each model and rebuilt all the integral elements of the architecture. Every bike has a new chassis, new suspension and completely redesigned engines. The 250 EXC is no exception. The 250 EXC has long been an underrated bike due to a lack of torque pull, making it a choice for the normal guy wanting a two-stroke but shunned by extreme enduro stars. The engine development has allowed KTM to take the bike to a whole new level. Although it is still a 250 two-stroke, the new 250 EXC now has more torque, more power and smooth delivery. The biggest change to this beauty is the new crank counterbalance, which removes the sharp, harsh vibrations typical of a two-stroke. These have been replaced by a muted, softened version, making it more pleasant on the hands. The biggest advantage of this is the increased life-span of the bike, bearings and most other wear parts, which means that you get to enjoy your fantastic machine for years to come. 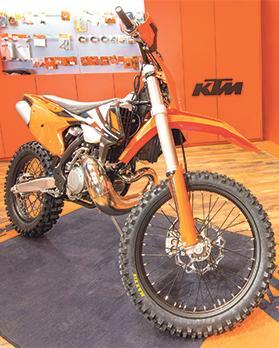 Fapi Motors are the official distributors of KTM motorcycles in Malta. For more information visit the Fapi Motors showroom in Mdina Road, Attard, or send an e-mail to info@FapiMotors.com.